In 1930, Paramount began production of it's final series of banjos. This would be the "Super Paramount" series. These came with their own serial numbers which were in three digits. There were three models produced. All had identical construction, but there were many differences in the artistic decorations. The Ensemble King was not very decorative, being nickel plated, made in maple wood, and with a rather plain resonator design. 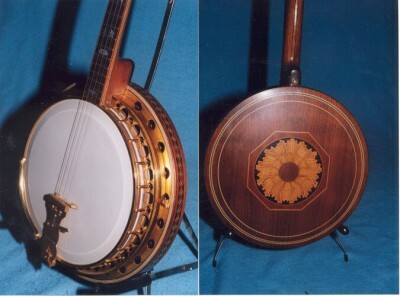 The Artists Professional, as seen here, was made in American walnut, with gold plating, and a sunburst wood inlay design on the resonator, as well as intricate inlay work on the resonator side. 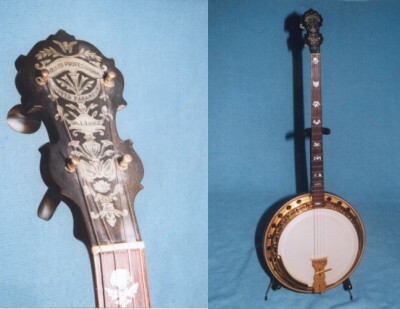 This banjo seen has a serial number of 166, and was made in 1931. The most elaborate of the three was the Artists Supreme, as seen on a previous page. 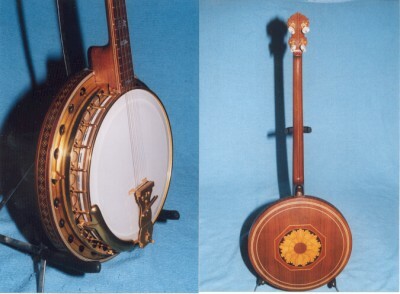 All three models had the double stepped resonator, unique to Paramount, and not seen on any other banjo. All three also came with a large one piece tone modifier tailpiece mute. An interesting bit of trivia is that most people familiar with these banjos, call them Artist Professional and Artist Supreme. Even the Paramount catalogs of the day used this designation. However, a close up look at the peg head of any of these banjos will clearly show the correct name as ARTISTS Professional and ARTISTS Supreme.